In all his chorale arrangements, Bach took inspiration for the style and atmosphere from the words of the hymn on which his composition was based. But the main role in his chorale partitas seems to be given to pure pleasure in playing and inventiveness. For his variations on ‘Sei gegrüsset, Jesu gütig’, he literally pulls out all the stops. For over twenty minutes, he explores the harmonic, rhythmic and stylistic possibilities of the melody forming the base of the piece. The art of variation was already considered old-fashioned in Bach’s day. But Georg Böhm, the organ virtuoso with whom the fifteen-year-old Bach became acquainted during his schooldays in Lüneburg, was a master of variation. Through Böhm, Bach also came into contact with Reincken, and through him with Buxtehude, who were both composers with a flair for the art of variation. There was much that Bach could learn from these masters, but the challenge of variation must have held particular appeal for the young composer. It was not just conceiving of the most varied and sophisticated series possible, but also the virtuoso interpretation of that series that provided the opportunity of rivalling his idols. 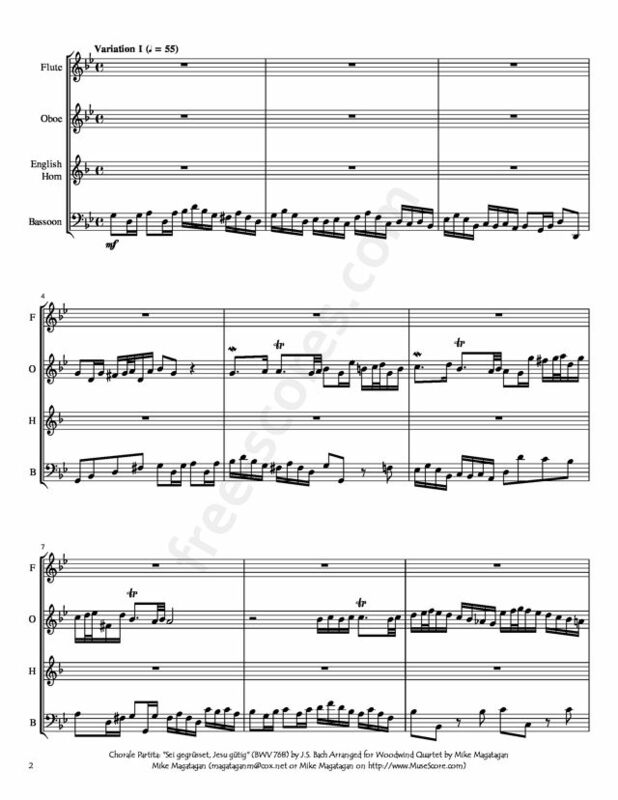 The chorale partita (BWV 766-770) is a special form of chorale arrangement, as the chorale (or hymn) serves as the starting point for a series of variations. The art of variation was at its peak in the seventeenth century. Usually, a folk song was taken as the starting point for a series of variations that increased in difficulty and speed. The genre was not restricted to keyboard instruments. The blind Dutch recorder and carillon player Jacob van Eyck was also a master in the art, for example. The five compositions by Bach bearing the name of chorale partita do not come from a single source, nor are they dated, but it is supposed that they originated in his teens and may have been revised later on. Bach left four sets of chorale variations that are fully accepted as his, of which this one is the largest, best integrated, and most comprehensive in the variety of variation techniques and textures that it employs. The first three sets are all relatively early works. The final set of chorale variations, the Canonic Variations on "Von Himmel hoch," was written quite late in Bach's life. The exact timing of composition of this and the other early chorale partitas causes lively discussion among Bach scholars. The first two might have been written when he worked in Lüneberg when he was between 15 and 17 years old and had a chance to work with Georg Böhm, a composer prolific in the chorale variation genre. Others point to the fine part-writing and motivic development that developed later in Bach's career. The style is consistent with compositions written in Arnstadt and Mühlhausen, where Bach worked until 1708, when he entered the service of Duke Wilhelm Ernst of Saxe-Weimar. Some scholars point out that Bach was known to write music in the style of this partita during his Weimar years. At any rate, this is a very inventive set of 11 variations on the theme of the chorale "Sei gegrüsset, Jesu gütig," (I Greet Thee, Merciful Jesus). The composition quotes the chorale in full as its opening statement, then presents its series of variations, using different variation techniques in each one. The other two sets of chorale variations are notable for not requiring pedals, and only five of these variations require them -- raising the possibility that Bach allowed for the music to be played by home keyboard musicians. The hymn tune itself is almost always easily heard, often in the top voice of the texture. The final section is a dazzling piece for full organ in five voices. It is possible that the individual variations in this set originated at different times and places, a supposition that is strengthened by some differences in quality among the variations. No definitive manuscript of the work survives in Bach's hand, and it has come down in a variety of different printed editions and hand copies made by others. These sources have some differences in detail and in the order of the variations themselves. Source: Allmusic (http://www.allmusic.com/composition/sei-gegr%C3%BCsset -jesu-g%C3%BCtig-chorale-partita-for-organ-bwv-768-bc-k 96-mc0002369055). 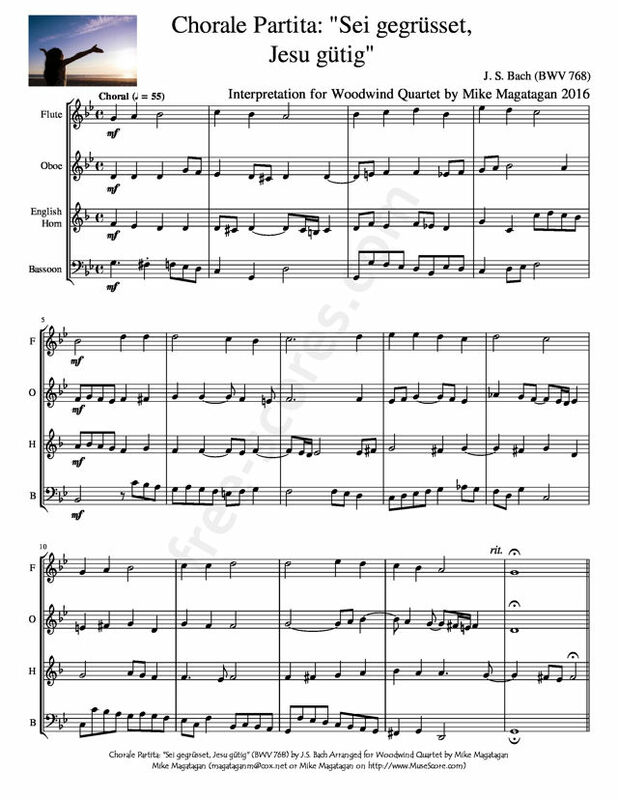 Although originally written for Pipe Organ, I created this Interpretation of the Chorale Partita (BWV 768) from "Sei gegrüsset, Jesu gütig" (I Greet Thee, Merciful Jesus) for Woodwind Quartet (Flute, Oboe, English Horn & Bassoon). 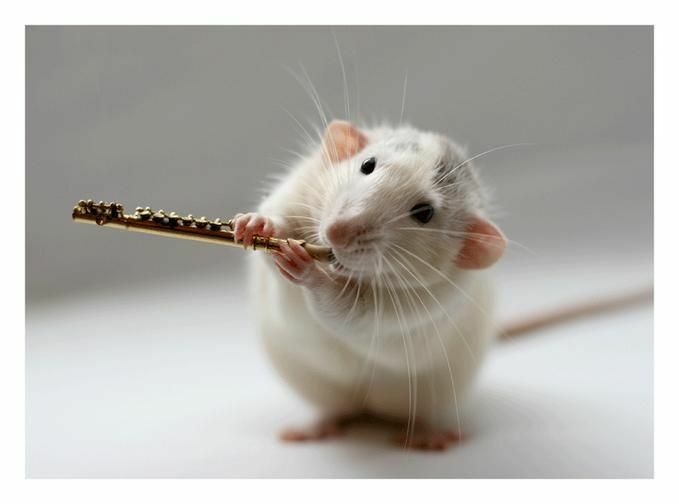 With this innovative new collection you get a great selection of popular tunes arranged for very easy flute duet. Books and CD.